HDSP High Definition Sound Projection is a KS invention that is related to NExT technology. KS Audio live PA products that utilize HDSP feature a cylindrical waveguide horn unit: a single-piece glass fiber-reinforced assembly recessed into the front wall of the cabinet. This enclosure is made from a high strength, water-resistant birch plywood designed to stop natural vibrations due to high sound pressure levels. The waveguide / horn handles how the frequencies above 2 kHz are dispersed to the audience. 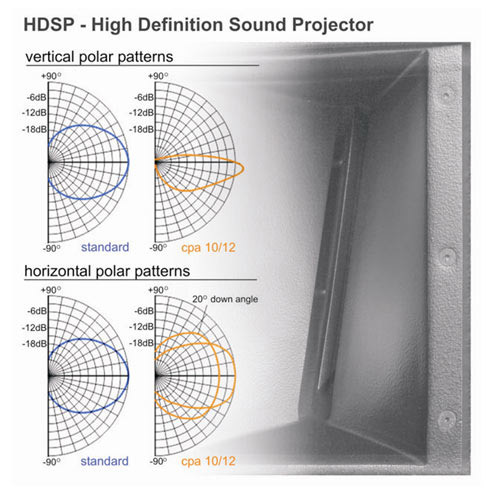 The new HDSP design drastically increases imaging intelligibility, especially in areas where strong wall reflections are present. The energy of the high frequency driver is created in the wave guide to produce a sound field with varying distances to a vertically bent line--meaning that the sound is dispersed from the horn at 120 degrees wide by a 20 degree vertical dispersion in the near field, and at only 60 degrees wide with a 15 degree vertical dispersion in the far field. There is an overall 5 degree down-angle, with no acoustical energy radiated above the top of the cabinet. The result is that all sound energy is directed in a bent wave front to point downward towards the audience, and not to the walls or the ceiling, resulting in an extremely even sound pressure distribution in the width--and depth--of a room. Thus, by precisely adjusting the sound field image from within the crossover area between the low frequency driver and the mid / high frequency driver, the signal is time aligned and phase corrected so that the inclined radiation axis is maintained within a wide frequency range. 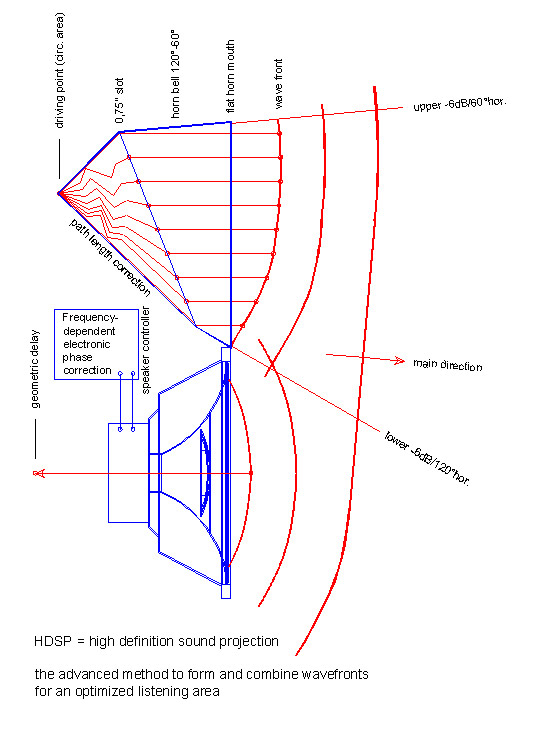 The frequency of the high pass filter has been selected so that the image focus resulting from the woofer diameter corresponds to the image focusing of the mid / high frequency driver, to combine the wave fronts for an optimized and coherent listening area. Besides incredibly detailed sound and excellent projection, the real world results are a reduction in inventory and equipment as well as labor costs for rental companies, and smaller required installation sizes and times for both rentals and fixed installations. One KS Audio speaker per side does the job of two or more competitors' speakers per side. Therefore, it is no longer necessary to install additional speakers for the front fill and far field ranges. HDSP is another KS invention that must be heard to be believed. Engineers the world over have marveled at how close a KS live system with HDSP sounds to a recording studio--even when the playback situation is an open field! Imaging stays consistent whether close to the speakers or far away, and the dynamics and clarity of the signal are well beyond anything experienced in live sound before.